The last light of the setting sun brings a pinkish glow to the western San Juans, The San Juan's are the largest range in the Rockies with more land above 10,000 feet than any other mountains in the country. A dozen peaks rise over 14,000 feet above sea level. Many of the peaks have snowfields throughout the year. 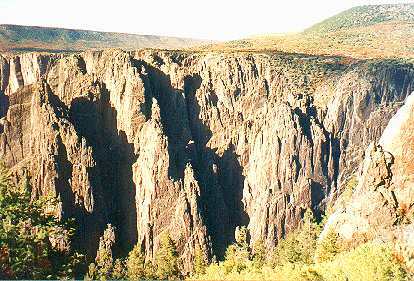 View is to south from the shoulder of the Gunnison Uplift. Thirty million years ago the San Juans erupted, covering this region with thousands of feet of volcanic ash and rock. Trapped by the mass of the San Juans to the south and the fiery volcanoes which became the West Elk Mountains to the north, the Gunnison River began to cut through the soft volcanic layers as it flowed west. Regional uplift 28-10 milllion years ago gave the River a steep gradient. 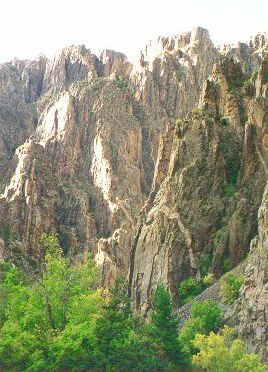 Then about two million years ago, the Gunnison, now deeply commited to a course between the mountain ranges, was forced to start cutting through the top of a 65 mile long metamorphic blister which had intruded under the softer sediments 60 million years previous. 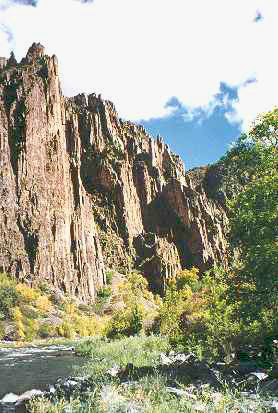 Occasionaly swollen with glacial runoff, huge boulders and gravel contributed abrasive power to help the river wear a deep groove in the metamorphic hump known as the Gunnison Uplift, gradually creating the spontaneously arisen shrine which is the Black Canyon of the Gunnison. Narrower and deeper than any canyon in the country for the twelve miles that it passes through the park 1750 to 2200 feet deep, 1150 feet across the canyon, from rim to rim at the Narrows. The walls are Precambrian gneiss, similar to the Vishnu Schist found in the deepest part of the Grand Canyon, and closely related to the rock that underlies much of the North Amercian Contintent. A short distance back from the rim, immediately above the dark gneiss, layers of mesozoic shales and sandstones lie upon a 220 million year unconformity, one of the largest blanks in the geologic sequence exposed in the US. When this area rose above the sea as part of the ancient highland of Uncompahgria, all the Paleozoic sediments were washed away. Rocks laid down in the period from 435 to 205 million years ago are not anywhere to be found at the Canyon. Jurassic (205-138 mya) and Cretaceous (138-65 mya) sediments are capped by younger West Elk volcanics on the highest hills, such as the one visible on the extreme right in this photo. Four separate mountain ranges rose and were washed to the bottom of several seas in this area before the metamorphic whale surfaced. Eventually the top of the crystalline dome, the Precambrian swell, was scoured flat by the great destroyer and its organic agencies, wind and water, before the Entrada Sandstone and subsequent layers were deposited. Fractures in the 2 billion year old Gneiss were invaded with hot igneous fluid which shot through the bedrock, hardening and cooling into large crystals visible as pink granite intrusions, and pegmatite dykes. This created a tough matrix, highly resistant to erosion, which weathers into the near vertical walls and fins of the canyon. 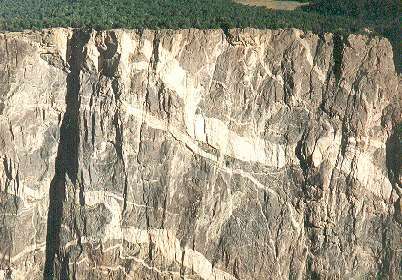 Early proterozoic gneiss is marbled with light-colored igneous dykes on the 2000+ foot face of Painted Wall, the highest cliff in Colorado, over twice the height of the Empire State Building from rim to river. There were climbers who spent the night on the wall when this photo was taken but they are so small, I can't find them. Pinyon-Juniper and Gambel Oak dominate the forest above. Archeological evidence indicates that prehistoric bands and more recently, Utes Indians, had hunted and camped on the rim, but did not occupy the canyon itself. In 1905 work was begun on a diversion tunnel 5.8 miles long which would carry enough water to irrigate a sizable farming community. It was finished in 1909 and now irrigates the Uncompahgre Valley. The Gunnison River has the highest rate of fall per mile of any major river in North America, dropping over 2000 feet in fifty miles. That is an average of 43 feet per mile, but within the park itself, it falls at 95 feet per mile. While we were there, Navy Seals were getting some practice looking under house-sized boulders for the body of an angler from New York City who didn't realize how strong the current was. On the eastern end of the Canyon, the water is impounded behind three dams. Although this is great for trout fishing, the River's ecology is slowly changing due to lower water temperatures and reduced flow. Still, the twelve miles through the canyon are designated a wild and scenic river and you don't really know the place as well until you get down to the water and look back up. Flowing a brief 53 miles before merging with the Colorado, the Gunnison has created a very special place to appreciate the wonder of simply being here at all.